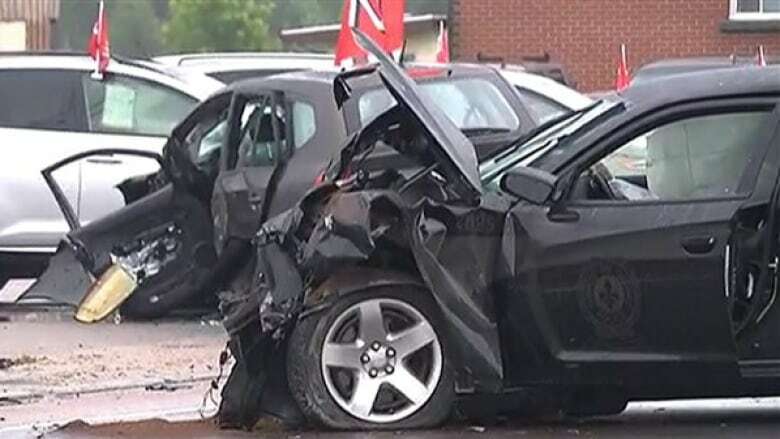 Quebec provincial police have changed the rules for officers driving unmarked cars following an accident earlier this month that involved one vehicle and left three seniors dead. Lt. Guy Lapointe of the Sûreté du Québec said unmarked or unidentified cars can now only be used under certain circumstances. "If there is a call that comes in during the day, the officer that would be driving this vehicle would not be allowed to answer an emergency call unless it's the only emergency vehicle available, or if he's the closest one and there's a direct threat to someone's life on said call," Lapointe told CBC. The changes were put into effect last Thursday. The collision occurred on July 18 in Dolbeau-Mistassini north of Lac St-Jean while police were responding to a domestic violence incident. Witnesses say the unmarked police car followed two other squad cars travelling at high speed in response to an emergency call. François Martel, whose 80-year-old father Georges was driving the car involved in the crash, has said he believes the unmarked cruiser would have been more difficult for his father to spot and and should not have been involved in the chase. "An unmarked car should not be speeding with other cruisers in town," he said. "If he's mixed up with other cruisers, then he's camouflaged. That's an accident waiting to happen. I'm mad about that." Lapointe refused to comment on the specifics of the incident, citing an ongoing investigation by Quebec City police. But he said the SQ wanted to act as quickly as possible. "Obviously when an event like the one on July 18 happens, it's tragic. I think it's our responsibility to right away put in measures to make sure that we're ensuring the security of the population and our police officers," he said. Lapointe made the distinction between unmarked police cars and undercover vehicles, which have no police markings. He said unmarked cars, which are equipped with sirens and flashing lights inside the windshield of the vehicle, are intended for highway patrols. Last year, five-year-old Nicholas Thorne-Belance was killed by an undercover police car south of Montreal. Lapointe said changes have already been made to make those safer as well.